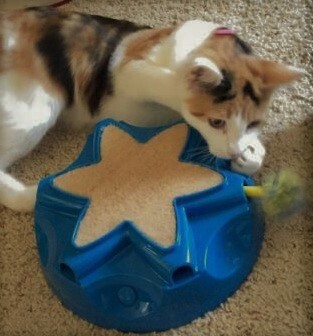 OurPets Catty Whack Toy is actually intended for cats. 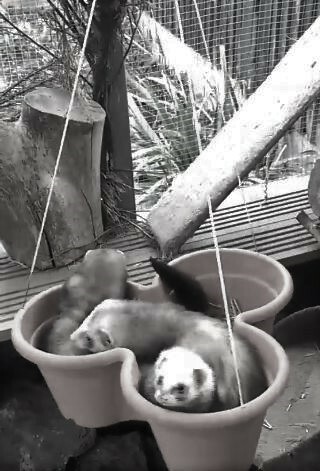 But that doesn’t mean ferrets can’t enjoy it too! 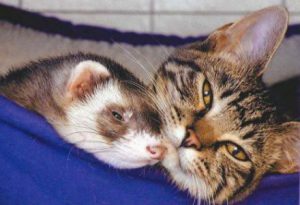 Ferrets and cats have a lot in common. 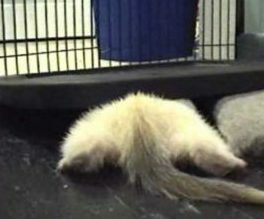 One big similarity is that cats and ferrets have hunting instincts that they like to use when playing. Another similarity is, like cats, ferrets sleep a lot. But, when they are awake they need to be active and expend all that energy they store up while sleeping. Cats and ferrets both need mental stimulation from play to keep from being bored and to fulfill their hunting instincts. Physical activity from play keeps pets physically fit and enriches their quality of life. More than just exercise, playing also relieves anxiety, stress, and boredom. We all know what happens when a ferret gets bored and starts looking around for something fun to do! OurPets Catty Whack Toy is an unpredictable motion and sound game where hunting instincts are activated in play. This interactive toy is specifically designed to encourage independent play. It’s a type of hide & seek action game with a fast-moving feather wand that peeks out randomly from different places. The erratic movement of the teaser keeps your ferret’s attention as he tries to figure out which of the 6 holes the teaser is going to peek out of next. Other features included a chirping/squeaking sound that your ferret may find interesting. It has a carpeted top so your ferret has a soft place to plan his attack from above. The bottom of OurPets Catty Whack Toy has 4 non-skid rubber feet, which keep the toy from sliding around as your ferret plays. There is an automatic shut off that turns the toy off after 10 minutes–probably long enough for most ferrets’ attention span. The dimensions are 10” x 4” x 10” and it takes 4 “C” batteries–not included. 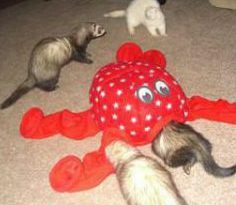 OurPets Catty Whack Toy may be a great option for ferret parents looking for a unique ferret toy where hunting instincts are activated in play. Like cats, ferrets are intrigued by the erratic movement of the teaser and have fun trying to catch it. Because the feather teaser can be pulled out if your ferret catches it and pulls hard enough, supervising your ferret while playing is recommended. 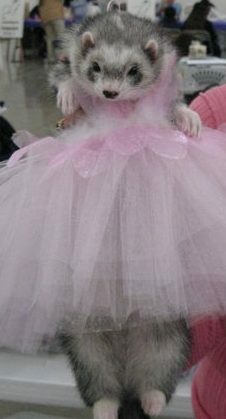 Get your OurPets Catty Whack Toy HERE. Looking for other interactive toys? 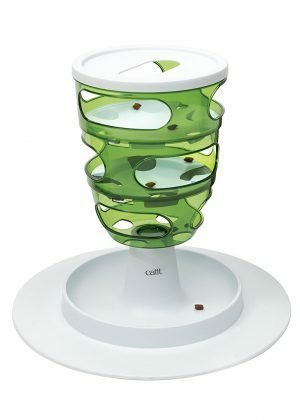 Check out Ferret Toys–Rumba For Ferrets, Catit Design Senses Food Treat Maze, and Catit Flower Cat Water Fountain. 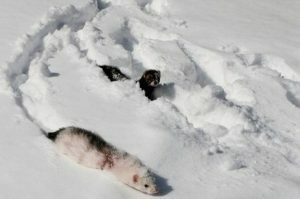 Ferrets are always looking for fun, but sometimes what they see as fun is dangerous or destructive or both. 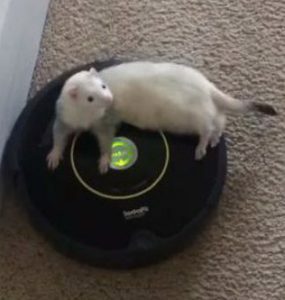 As ferret parents, we are always trying to come up with new ways to safely entertain our fur babies. Sometimes we need to think outside the box (or cage) to discover new ideas for ferret toys. DIY ferret toys can be a creative and fun way to give your ferrets new experiences. 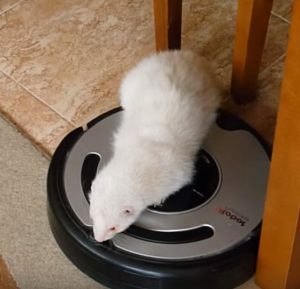 Did you know you can have your floors vacuumed and entertain your ferret at the same time? The problem is, ferrets have a short attention span. They may play with a toy for a little while or may just stash their toys in one of their favorite hiding places. Some interactive toys or self moving toys keep a ferret’s attention longer. One of my ferrets loves her walking toy kitty She bounces at it as it moves until she knocks it over. I have to keep standing it up so it continues to walk and she continues to jump at it. Another one of my ferrets loves to play with water, so she has a lot of fun with her Catit Flower Water Fountain. These interactive ferret toys are great and many ferrets love to play with them. 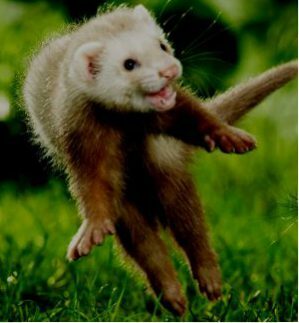 Some ferrets, however, play with a toy for a short period of time and then lose interest in it and never play with the toy again. 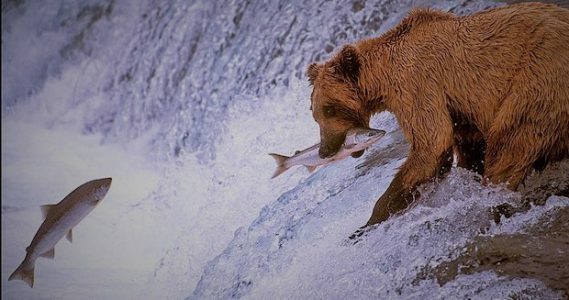 Salmon, in general, is an excellent source of vitamin B12, vitamin D, selenium and a good source of niacin, omega-3 fatty acids, protein, phosphorus and vitamin B6. It is also a good source of choline, pantothenic acid, biotin, and potassium. When used in moderation and sourced from reputable brands, salmon oil is a beneficial addition to a ferret’s balanced diet. Not only is it good for a ferrets’ skin and coat–helping with dry skin, itching and adding shine– but it is also beneficial for their heart, eyes and joint health. Salmon oil is a great treat that can be used for distracting your ferret when clipping nails or cleaning ears. 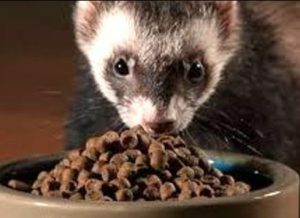 The benefits of salmon oil have influenced many pet owners, including ferret parents, to incorporate salmon oil into their fur babies’ diets. Overall, supplementing with salmon oil is good for pet health; however, too much of a good thing may have adverse effects. Continue reading Wild Alaskan Salmon Oil–Good For Ferrets? Playpens are not just for toddlers and puppies! If you have a ferret (or 2 or 6) you know that they can get into lots of trouble when left unattended. However, it may not always be practical to keep an eye on your ferret while he is out of the cage–especially if you have more than one. Ferrets are often bored in their cage and just sleep. Or they may get determined to break out. 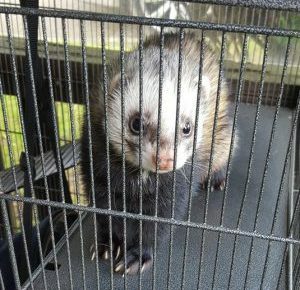 One of my ferrets, Toby, likes to grab onto the rungs of the cage door and pull and shake it with all his might–trying to escape. Ferrets need plenty of time out of their cages in order to be happy and healthy. I have been often asked how I keep my ferret’s nails so neatly cut and trimmed. Many ferret parents leave it to the Vet to take care of this grooming necessity. However, it’s not that difficult if you know a few tricks. Ferrets cannot keep their nails at the proper length on their own. They don’t get worn down much naturally and grow quickly. 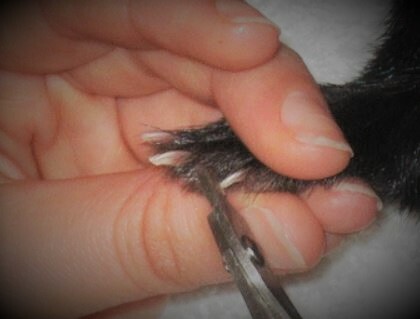 If left untrimmed too long, a ferret’s nails will start to curl and grow under her paw and even into it. 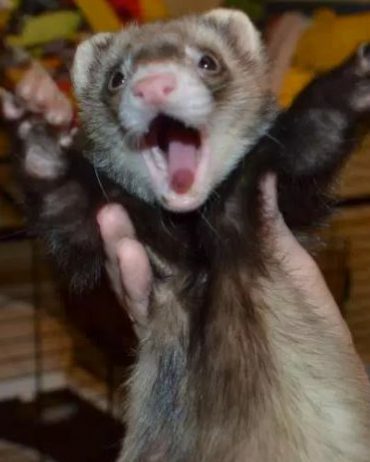 When your ferret’s nails are too long, they can have tears, sharp points, and ragged edges. She can easily catch them on bedding, furniture or carpets. This could break the nail, tear it, or rip it off completely. Your ferret could further injure herself from trying to free her paw. As popular as ferrets are, there are just not as many products specifically designed for ferrets as there are for cats or dogs. That being the case, I am always on the lookout for pet products that may work well for ferrets. The Catit Design Senses Food Treat Maze is designed for cats, but can be a fun and stimulating toy and feeder for ferrets! Food/treats go into the maze. Your ferret reaches in, or climbs in one of the openings and moves pieces of food or treats from the top of the maze tree to the bottom. As the food or treats move through the maze, they collect in the food tray at the base of the feeder toy–ready to be eaten. A playpen can be a valuable addition to your ferret supply repertoire. 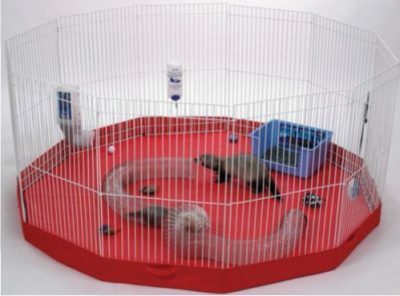 The proper playpen can provide your ferret with a safe place to play in a confined area. It can come in handy in a multitude of situations. 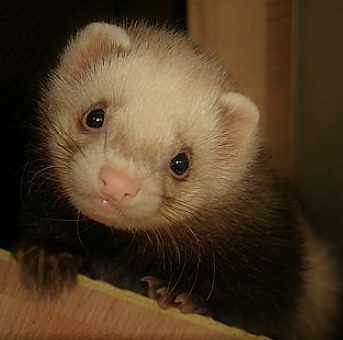 However, it’s important to get your ferret the right playpen–one that is ferret proof and suits your particular needs. I hope you have enjoyed Ferret Words of Wisdom About Life. 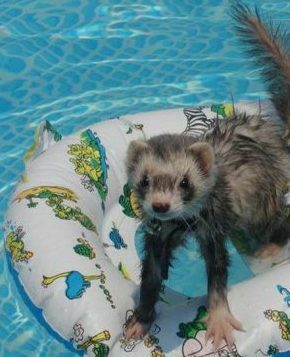 Check out some of my other posts for all things ferret! 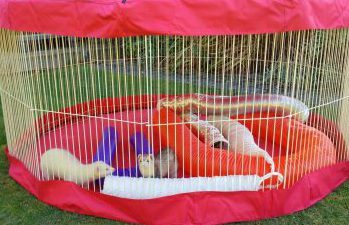 Are you looking for a ferret proof playpen? Somewhere to keep your fuzzies out of trouble? Playpens can be used in a variety of situations, for a variety of purposes. It’s important to get the right playpen for your particular needs. 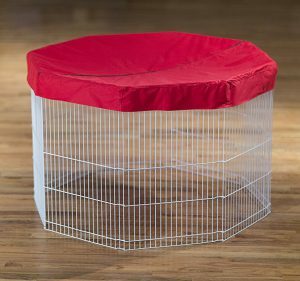 Prevue Pet Products offers a playpen for ferrets (and other small pets). Let’s take a look to find out if the Prevue Pet Products Playpen is a good choice for you and your ferret.